Gas chromatograph columns (GC columns) are tubes through which solutes being measured pass at a rate primarily determined by their physical properties and the temperature and composition of the column. The speed at which solutes move through the column can be weighed against a number of variables to determine its specific properties. As each solute elutes from the column, it enters a heated detector. An electronic signal is generated upon interaction of the solute with the detector. This signal is recorded and plotted. GC columns are either packed or capillary style. 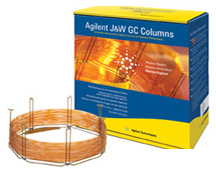 Packed GC columns are typically of glass or stainless steel coil construction. They are generally one to five meters in total length with an inner diameter of five millimeters. These devices are filled with a stationary phase, or packing coated with the stationary phase. Capillary GC columns, also known as open tubular columns, are composed of two major parts: tubing and stationary phase. A thin film (0.1-10.0 micro meters) of high molecular weight, thermally stable polymer is coated onto the inner wall of small diameter tubing, usually 0.05-0.53 mm I.D. 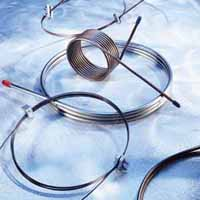 Among capillary columns, there are three sub types to choose from. Support coated open tubular (SCOT) columns have an inner wall of the capillary that is lined with a thin layer of support material, such as diatomaceous earth, onto which the stationary phase has been adsorbed. Porous layer open tubular (PLOT) columns are capillary GC columns in which the stationary phase is based on an adsorbent or a porous polymer. Wall-coated open tubular (WCOT) columns consist of a capillary tube whose walls are coated with liquid stationary phase. One of the most important specifications for GC columns is the material. Typically they are made of stainless steel, glass or a silicate glass such as alkali-borosilicate glass, borosilicate glass or alumina silicate glass. Length of the columns is very important as well, as are the inner diameter and the film thickness. Another factor to consider is the rated operating pressure required for the application.